What are the survival prospects of plain simplicity? Being simple & adhering to simplicity can backfire? Is being simple silly & not seen as an object of desire? Simplicity means lacking class & being backward? Or is Simplicity a class apart to propel forward? Should we at all choose Simplicity as our pick? Da Vinci felt "Simplicity is the ultimate sophistication"
In Simplicity is there any use, beauty & inspiration? "Simple living, high thinking" - Do you follow? Is Simplicity a great treasured asset for you? I like what DaVinci said about simplicity being the ultimate sophistication. There's something elegant about a uncluttered room, a single flower in a vase, etc. Beautiful poem, Anita . The fact that we derive the purest joy from the simplest pleasures , proves that "simple" is precious . Cheers to your post ! In this fake world, we make simplicity sounds like silly and plain stupid. You've put it so well. Nothing beats the simple things of life. I like things kept simple, complicated and cluttered is stressful uff! Oh to wish that life was more simple.. I definitely crave for a much simpler world, but simplicity today seems hard to find! Glad to see you in the pantry, Anita. Simplicity is a hard find in today's world, isn't it? Thanks for visiting my blog and commenting. I love the fact that this A to Z Challenge encourages me to read blogs I might never have found!! I crave simple or perhaps simpler on a number of levels. One of my favourite ways to achieve a bit of simplicity occurs when we go camping because we have no electronic beyond a movie if it rains, and that includes no turned on cell phones, there are no chores, no media or social media sites hammering at the senses, and excterea. It is family time and it is outdoors time set against the backdrop of nature sounds and smoke from a campfire. Great post, thanks for sharing. I think we all need to come back to a more simplistic approach to life - we complicate and overthink everything and that is when we start making mistakes and worrying about stuff that might not even happen. Those last lines are stellar! Simplicity is the key to meaningful life. We are complicating our lives unnecessarily as human kind. I am trying to simplify and declutter things in life - not just the home but in thoughts too. I like simple and often the simple dress is more sophisticated than the overdone. I prefer simplicity for it's pure and more honest. 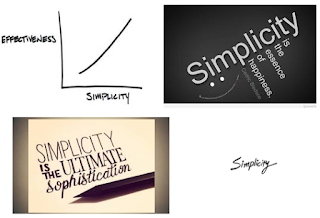 Henry David Thoreau said "Simplify, simplify, simplify" ... and someone said if he really meant it there would have been only one simplify! Nonetheless, in my book simplicity IS class. Loved the poem! Simplicity slows things down and makes life more peaceful. A cool topic. Simple is a complex stay of being. And too many out there--who believe themselves too grand--can never grasp the depths of a simple lifestyle. Too bad... for them and their dreams. I think there is something about simplicity that draws itself closer to authenticity and that is what makes it beautiful. I like the idea of simple living but acknowledge how difficult it is to live a simple life in today's complex and consumer driven society. I live simply for the most part. Names alone mean hardly anything to me. That said, I do enjoy simple luxuries like thick, soft cotton towels, leather seats, etc. It is easy to talk about Simplicity but hard to attain. Simplicity could be understood in words of Kabir as "ज्यों की त्यों धर दीन चदरिया"
Oh yes -- simplicity can be very sophisticated. So agree with DaVinci and Jobs! As you mention today's world is so superficial and hollow trying to make things complex!